Manufacturers rate air conditioners on how much heat they can move from inside to outdoors. This rating is given in British Thermal Units or BTUs. A 5,000-BTU air conditioner moves less heat than an 8,000-BTU air conditioner, but the larger unit will use more electrical power than the smaller unit. Different models of air conditioners may use electric power more or less efficiently. This prevents a direct conversion from BTUs to watts, but you can calculate the power used. 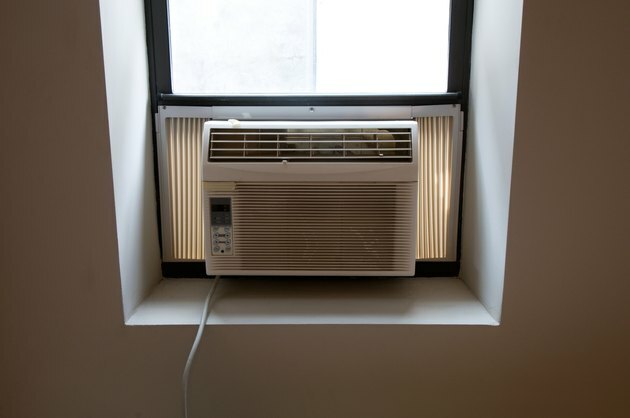 A small window air conditioner is rated in BTUs, not watts. Read the appliance nameplate information and determine the number of amperes the appliance draws and the voltage on which it operates. Most modern appliances supply the information on a metal plate or sticker and in accompanying documentation. Multiply the current in amperes by the voltage. The result is volt-amperes, which equals the number of watts used by the device. Electric utility companies sell power in kilowatts. Multiply watts by 1,000 to convert to kilowatts.